UNALASKA — Whether undersea or underground, the mixture of water and telecommunications is a continuing challenge for GCI’s TERRA Aleutian Program, aimed at improving internet and cellphone service in one of the most remote areas of Alaska. The telecommunications company is proposing an 869-mile underwater fiber optic cable route, along the south side of the Alaska Peninsula, stretching from Kodiak to Chignik and ending in Unalaska/Dutch Harbor. TERRA stands for Terrestrial for Every Rural Region in Alaska, and the company has completed its Southwest and Northwest projects that have connected 45,000 residents in 84 towns and villages. Bringing in Akutan, Cold Bay, False Pass, Chignik Lake, Chignik Lagoon, Sand Point and King Cove, the new route connects more people to high speed internet, compared to the former plan offshore of the north side of the peninsula, according to GCI Vice President Dan Boyette, the general manager of the TERRA Aleutian Program. The southern route, crossing the Shelikoff Strait from Kodiak Island’s Larsen Bay to the mainland at Chignik, is spendier than the $40 million previously proposed for the northern path leaving the mainland in Levelock, and top corporate officials still haven’t committed to laying hundreds miles of sunken cable. Kodiak gets the internet by subsea cable from the Kenai Peninsula, a more reliable delivery system than the satellites up in the air over the Aleutian Islands. It would bring significantly faster Internet connections, compared to the pokey satellite-based system now in place. “Backups and updates will take minutes, not days,” according to Anchorage-based GCI. Whether TERRA Aleutian pencils out is still unknown, though promising. Already, GCI has spent $2.5 million planning the TERRA Aleutian project. Boyette said he is seeking five-year commitments from potential customers in the fishing and transportation industries. Already, seafood companies Unisea and Trident have pledged support, he said, among 15 businesses operating in the region between Chignik and Unalaska/Dutch Harbor, he said. If the project finds enough support, onshore work would start this year, and offshore cable laying would follow for the next two years. The planned completion date is Sept. 30, 2020. And with those commitments, the business plan is advancing into its final stages, he said. The latest big challenge is working with the Federal Communications Commission on internet services for rural health facilities, he said, and hopes that regulatory issue will be completed by the end of summer. Meanwhile, absent the subsea cable, faster service has come to Unalaska, even with satellites, from new antennas and towers bringing 4G LTE service. With 4G LTE, customers can access the internet on cellphones, a big improvement over the old 2G system, limited to voice and texts. But with 4G LTE up and running, that should take some pressure off the 2G service, leading to better voice communications, he said. But even on land, water is still a problem. The proposed cell tower in Unalaska Valley has been delayed again and again. This time it’s groundwater too close to a city drinking water supply. Last time it was neighborhood complaints on Stewart Road, for health concerns involving radio waves which are not grounds for denial per federal law, though impacts on nearby property values are a valid reason for local authorities to nix a cell tower, which the city council did on an appeal of the planning commission’s approval last year. Local resident Rufina Shaishnikoff opposed the tower adjacent to her property. The replacement site presented its own problems, with health concerns outside the jurisdiction of the Federal Communications Commission, but within the range of veto power of local authorities backed up by the Alaska Department of Environmental Conservation. GCI had to redesign the foundation for the tower on the city pipeyard site on East Broadway, because it’s within 200 feet of a city water well, according to Unalaska Department of Public Works Director Tom Cohenour. The new foundation would have been shallower than originally proposed, when it descended 19 feet to bedrock, below the water table eight feet down from the surface. The shallow foundation would have employed a 40 by 40-foot layer of buried geofoam, secured on the surface by big concrete weights. And now even that’s site been abandoned, because of the watery subsurface conditions. City Engineer Robert Lund informed GCI of the city water utility’s fears of contamination of the “relatively shallow” well. “Their concern is surface water intrusion where deep or driven pile foundations could act as a preferential pathway for surface waters or drilling fluids to enter Well 1A,” Lund wrote in a Nov. 22 memo. DEC’s Daniel A. Reichardt agreed, saying digging down to bedrock “presents a significant temporary risk of contamination of the aquifer.” He recommended that the well not provide drinking water during construction activities. The site was located across the street from the Unalaska Department of Public Works, on land leased from the city. And now, that site won’t work at all because the water table remains too high for a tower foundation. “We’ve decided to skip it, and we’re back to the drawing board looking for another location,” Boyette said on June 13. 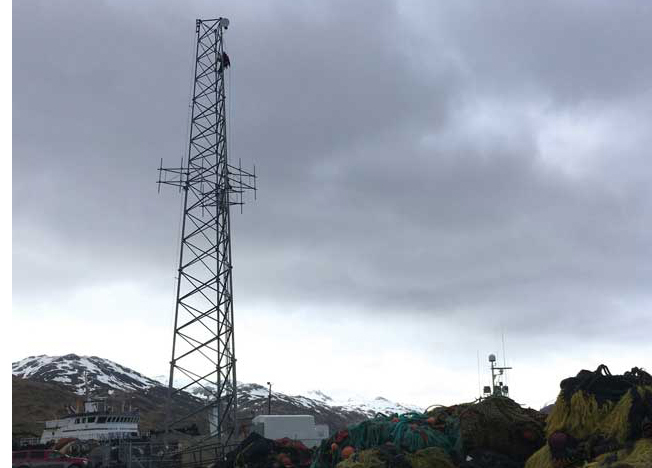 The new site will once again be in the residential neighborhood of Unalaska Valley, where GCI hopes to finally find a third site where a tower can finally rise. The issues with with the Valley site near the city drinking water well could have shutdown the seafood processing industry in the nation’s top volume fishing port, according to a scenario Cohenour spelled out in a letter to GCI. “During the seafood processing seasons a simultaneous shut down of well 1A and the Pyramid Valley System will shut down fish processing. Wind events regularly cause temporary shutdowns of the Pyramid Valley System due to high turbidity. If well 1A is is compromised the only solution is to replace it or install filtration and unknown impacts to the seafood industry,” he wrote in a Jan. 17 letter to GCI’s Cyndi Coughlin. But other 4G LTE tower projects are going well, Boyette said. That’s the new structure on Captains Bay Road at the private dock operator Offshore Sytems Inc., and new equipment on the existing tower on Haystack, a prominent hill overlooking the community. Unalaska is working with GCI as it seeks to install an underground wiring network. Boyette said GCI plans to develop a cable television service for residents, and that will mean the company will have a higher profile locally with trucks and more workers.